At our 2018 children’s tea, My Christmas List… Time Together, guests shopped at our Dainty Teacup popup shop. There, they met… and fell in love with… our new collection of adorable ‘Tea Bud’ dolls, designed for boys and girls. 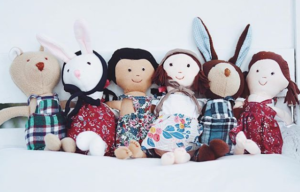 These soft handmade cloth dolls have their own unique names and sweet personalities. Our dolls are available at our online shop. If you are selecting a doll as a gift for someone, you can choose which one will be the sweetest companion for the little one who receives it. Each doll from this collection is a huggable animal or baby in need of a loving home. If you purchased and took home a doll at our Christmas tea in December of 2018, you were also supporting HELP Pregnancy Center of Monroe. We must warn you, when you see this collection of handmade cloth dolls at our pop-up shop, your heart will melt. Their personalities shine right through the threads of their stitched smiles and seams. They are ready to go home with you! Practical and patient, Jane is a devoted and warm friend. Jane is an earnest listener seeking to be useful in work, merry in play, and encouraging at all times. 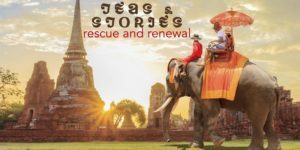 Rising to any occasion, Joy is a friend that endures all circumstances. Joy is a dreamer and brings a beautiful radiance to even the darkest of days. Social and ambitious, Acorn believes that big things come from small beginnings. Acorn is a lovable companion who is never complacent and always courageous. Mischievous and warmhearted, Theodore is an amusing and fair-minded companion. Theodore loves a good laugh and is filled with kindness and compassion. Steady and poised, Boxwood makes a way where there seems to be no way. Always ready to meet new circumstances with poise and confidence, Boxwood is an adaptable unflappable companion.